Three great economic and financial thinkers gave great advice on how to deal with financial crises: J.P. Morgan, Walter Bagehot, and Ludwig von Mises. Unfortunately, the wisdom and experience of these three thinkers was almost completely ignored during and after the "GFC." This contrasts sharply with what was done in the 1930s; hence, we still have very high systemic financial risk, poor regulation, and massive risk-taking. The ghosts of crises past now stalk Wall Street; I like IAU, GLD, WHOSX, TLT, and IEF under these conditions. 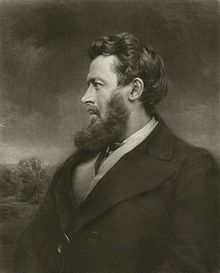 Walter Bagehot is actually most famous for his so-called "Bagehot's Dictum," i.e., “In times of financial crisis central banks should lend freely to solvent depository institutions, yet only against sound collateral and at interest rates high enough to dissuade those borrowers that are not genuinely in need.” This advice, and that of J. P. Morgan, was comprehensively ignored during the Great Financial Crisis (“GFC”). In fact, insolvent firms were saved in large numbers, the bigger the better; sound collateral was not given in many cases; and interest rates were set so low on bailout funds that many firms around the world lined up for the Fed’s easy money. The rotten culture on Wall Street was such that some of that bailout money ended up being used for executive bonuses, according to the New York Attorney General’s office, as reported by Stephen Bernard of ABC News (2010). Other sums provided by bailout programs like “TARP,” “CPP,” “SBLF,” etc., were used to finance merger & acquisition activity, the repayment of other bailout loans, and many other uses. One thing that really didn’t happen (in spite of promises to the contrary) was an expansion of bank lending to help the economy. This latter quote is of direct relevance to our current situation. 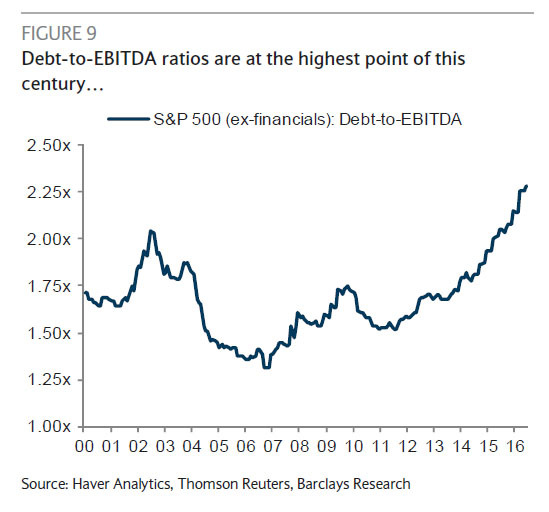 Indeed, I am concerned about the recent, massive increases in U.S. corporate debt relative to cash flow (Chart 1), since they suggest that the credit expansion has probably peaked. 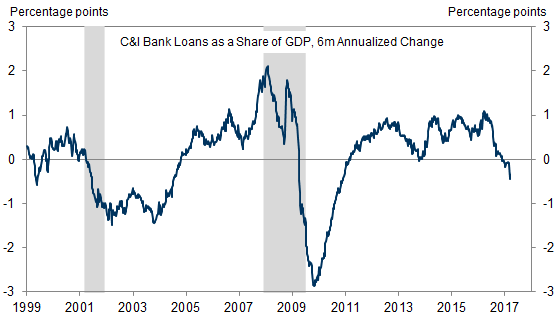 This year’s apparent collapse in U.S. C & I bank loans (Chart 2) suggests that the credit cycle has probably already turned down, in keeping with the above prediction from von Mises that booms fueled by credit expansions always collapse. I question whether anything in the realm of systemic risk was actually resolved for the long term, in spite of Bernanke and Company’s success at plugging holes in the 2008 dike with various fingers and toes. Unfortunately, Ben Bernanke, Hank Paulson, and Timothy Geithner constructed the massive and complex ad hoc bailouts of the “GFC” without any reference at all to Bagehot’s Dictum or J. P. Morgan’s advice on who to lend money to in a crisis. 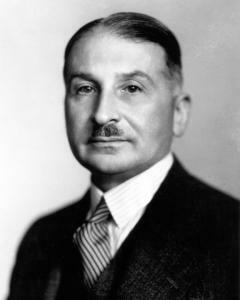 The teachings of Ludwig von Mises about government interventions were also ignored. Indeed, it seems to me that government decisions in 2008 and 2009 arose out of a sense of panic, but were conducted with a generous helping of ignorance, and were also presented to citizens with studied duplicity. Fed and Treasury policies adopted during and after the “GFC” were primarily based on: 1) the modern philosophical position that government and its technocrats must always have the solution, in spite of their implicit and explicit guilt in bringing on the crisis in the first place; 2) the fact that, because federal technocrats have no apparent commitment or loyalty to any political or economic philosophy other than their own survival, virtually anything goes, even blatantly unconstitutional actions, outrageous and unjustified self-serving secrecy, and appalling political duplicity; 3) the pursuit of political and practical short-term expediency which took precedence over all other considerations (due to the scope of the panic), rather than the achievement of any particular economic goals or financial principles that would have reformed the system; 4) a complete disregard for the basic principles of capitalism, and while we’re at it, democracy; and 5) an almost unlimited grab for power by unaccountable federal technocrats that has never been acknowledged nor even relinquished, with the result being a permanent corporate welfare system that favors giant banks. Thus, an amazing series of arbitrary, incoherent, and seemingly impulsive decisions were made in 2008 and early 2009. One of the better examples of this kind of decision-making was the arbitrary way it was decided to save Bear Stearns in March 2008, and then to incoherently sacrifice Lehman Brothers a few months later without any advance warning to the markets. Another example can be seen in Hank Paulson’s two distinctly different requests for the funding of the TARP program by Congress. The initial request for TARP funding in September 2008 was rejected by Congress after it was pointed out that taxpayers would be stuck with troubled bank assets permanently. This initial rejection of TARP by Congress led to one of the biggest one-day sell-offs of the entire “GFC,” with the Dow Industrials dropping 770 points. However, a week later an even bigger TARP bill ($700 billion) was passed easily, giving Hank Paulson carte blanche to spend the initial funding ($350 billion) buying big bank assets (mortgages) in order to recapitalize them. There were virtually no real strings attached, and almost no binding constraints on how to deploy the money. In fact, the Treasury abandoned the notion of buying troubled mortgages with TARP money (which was how the deal was sold to Congress) only a few days after the Emergency Economic Stabilization Act of 2008 was passed, and ended up trading cash for bank preferred stock instead. The legislation thus was sold on the basis of helping both banks and homeowners, but the latter were dropped almost completely out of the picture within a week. Planned deployment of TARP money to homeowners ended up comprising about 1% of the ultimate TARP budget. The idea that most big banks were forced to take the TARP money and didn’t really need it is almost certainly a Wall Street myth (Rolling Stone, 2013). Indeed, Citigroup (C) went back hat-in-hand for a second helping of TARP funds, and the venerable Goldman Sachs (GS) received $34 billion in secret Fed loans in addition to TARP money. In fact, Ben Bernanke testified in 2009 that 12 of the 13 biggest banks and insurance companies were actually on the brink of failure when TARP passed. In the meantime, the Federal Reserve took it upon itself to secretly provide a veritable mountain range of cash to avoid big corporate failures (estimated by the GAO at $7.7 trillion for the top U.S. banks and insurance companies, and a total of an additional, secret $9.0 trillion for the global banking and insurance systems; Tracey Greenstein, Forbes, 2011), all of this on weak or even poor collateral, with no questions asked, and with incredibly easy terms. Amazingly enough, almost all of the money was repaid over time. The result of this massive infusion of cash into the U.S. system was the explosion of excess bank reserves from $2 billion to $1.4 trillion. Much of the bailout money was used for highly questionable projects. For example, bailout money was used to finance the acquisition of Bear Stearns by JPMorgan Chase (JPM), and the respective acquisitions of Wachovia by Wells Fargo (WFC), and Merrill Lynch by Bank of America (BAC). Executive bonuses were not allowed under TARP, but there were ways around this (such as government waivers) that were used by many smaller banks. And famously, AIG (AIG) gave 73 employees over $1 million each in the midst of being bailed out. The biggest banks gave their executives restricted stock at the market low price, guaranteeing them huge profits. A number of big bank executives (and even an official at the NY Fed) also bought bank stock for their personal accounts right when the secret Fed money arrived, giving them what seems like an insider trading advantage. The secret Fed funding was not reported to shareholders because an aggregate $7.7 trillion was deemed “immaterial.” So the bankers who helped to cause the financial crisis cashed in, and the biggest banks got even bigger, even in the midst of that crisis. The implicit government guarantee behind the biggest banks gives them an estimated 0.50% spread advantage in the money markets, and that advantage over smaller banks appears to be permanent. Systemic risk was supposedly diminished under the later Dodd-Frank reforms by requiring much bigger cash reserves at all big banks. However, as already mentioned above, bank reserves aren’t the only thing needed to reduce systemic risk. Much of that newly beefed-up reserve requirement is in the form of debt, not equity. The equity portion of bank reserves should probably top 20% of the total, but as recently as 2015, it did not. Yet the top six banks have seen their assets grow from $7 trillion before the crisis to $9.9 trillion more recently (Jennifer Taub, 2015). It is also important to note that the top six U.S. banks (BAC, JPM, C, WFC, GS, and MS) recently (2013) had about 14,420 subsidiaries in aggregate, suggesting an unmanageable level of complexity. It has been estimated by the Kansas City Fed that it would take 70,000 bank regulators to adequately monitor these six banks. Those regulators do not exist. Furthermore, under current rules, it would appear that very large derivatives books can be off-loaded legally from big U.S. banks onto their foreign subsidiaries, thus neatly circumventing Dodd-Frank’s attempt to bring the wild derivatives markets under tighter control. This represents a potentially significant risk factor, and there is little to no oversight on this market in practical terms. There is now about $239 trillion in gross (notional) derivatives exposure at just the top six U.S. banks (Craig Wilson, The Daily Reckoning, 2017). Although the net exposure on this is much smaller (around $3 trillion?? ), there is almost no way to evaluate the actual systemic risk under the current regulatory system. The argument has often been made that the “GFC” was so dire that virtually everything had to be tried, and thus no conventional approach to resolving the financial crisis was possible. And since virtually all of the bailout money under both TARP and the secret Fed lending programs was paid back, no harm, no foul. This argument, if I could borrow a phrase used by Lincoln, “is thinner than the soup made from the boiled shadow of a starved pigeon.” Expediency was certainly required during the “GFC,” but it was also required in previous financial crises. What would the ghosts of crises past have said about all of this? I think they would have said, “Now you’ve done it. You’ve entrenched corruption and greed into the banking system permanently, at the cost of taxpayers, and there will be a permanent loss of faith in the system.” Indeed, that does seem to be the case. Compare this result to what happened in the Great Depression. President Roosevelt famously declared a “bank holiday” in early March 1933, during which time insolvent banks were immediately identified and closed. Depositors at solvent banks were given an implicit 100% deposit insurance guarantee that brought hoarded cash pouring back into the banks when they re-opened a week later (William L. Silber, 2009). The Reconstruction Finance Corporation, set up under legislation previously signed into law by President Hoover in 1932, then kicked into high gear, helping to restore public confidence in the system (Wikipedia, 2017). Wholesale financial reform was the order of the day, and as a result many useful (and surprisingly brief and simple) laws were passed. Hence we ended up with the FDIC, the SEC, the Glass-Steagall Act, etc. The system, in other words, was actually repaired and reformed, and public faith in the system was eventually fully restored. If you examine what was done in the crisis of the 1930s, you will soon discover that Bagehot’s Dictum was indeed applied, with good results in the end. 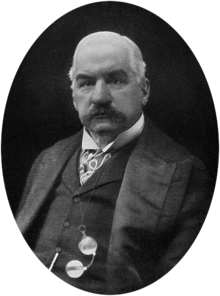 So were J.P. Morgan’s ideas about corporate finance; however, the ideas of von Mises were largely ignored. Hence, the great welfare state was born under “FDR,” and although there are a number of good things associated with that, there are some pretty bad things as well. The welfare state has now been extended to large corporations in a very dangerous way. The unfunded future liabilities of federal programs are also now impossible to cover. As I have said elsewhere, the system now seems to exist entirely for the care and feeding of well-funded special interests. As long as corruption in Washington and New York is the norm, we will remain dangerously exposed to systemic financial risk. True reform has not occurred in my opinion, since it is obvious that the same old game is still being played. So I think that the next replay of the “GFC” is only one financial firm’s failure away. Under these circumstances, I like gold (IAU, GLD) and bonds (WHOSX, TLT, IEF) for long-term investing in this harsh environment. Disclaimer: This article is intended to provide information to interested parties. As I have no knowledge of individual investor circumstances, goals, and/or portfolio concentration or diversification, readers are expected to complete their own due diligence before purchasing any stocks or other securities mentioned or recommended. This post is illustrative and educational and is not a specific recommendation or an offer of products or services. Past performance is not an indicator of future performance. Disclosure: I am/we are long IAU, GLD, WHOSX, TLT, IEF. I wrote this article myself, and it expresses my own opinions. I am not receiving compensation for it (other than from Seeking Alpha). I have no business relationship with any company whose stock is mentioned in this article.